View of the Arctic ocean (top), map of the Arctic in the late 19th century. Drawing depicting the launching of the ship "FRAM", Nansen built in 1892. View of the building of the Museum "FRAM" in Oslo. "FRAM" in the Museum, masts and ship's wheel. Photos of "FRAM" and the members of the expedition of Nansen during the ice TRANS-Arctic drift. Portraits of participants of a hike to the North pole - Nansen and J. Johansen. Pictures of the wires by the crew of the "FRAM" participants Hiking to the pole. Figure showing Nansen and Johansen during the campaign. Photos and pictures of episodes of the campaign. Ice floes in the ocean (top), the joint Soviet-Norwegian expedition on Board the helicopter, the faces of the members of the expedition. Arctic landscape in the Land of Franz Joseph. The arrival of the expedition to the Land of Franz Joseph. A member of the expedition is determined by the map the wintering site of Nansen to the Land of Franz Joseph, the faces of the members of the expedition. 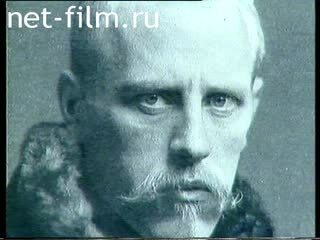 The participants of the expedition carried out an APB on location and behind the scenes are fragments of the diaries of Nansen. The types of Franz-Joseph, the Arctic landscapes. Pictures of Nansen, depicting the winter in Franz Joseph. Types of camps the Soviet-Norwegian expedition is blowing a Blizzard. Equipment of the camp, the preparation of inflatable boats. The members of the expedition sent to explore in a rubber boat. The measurement of air temperature. View of the surroundings of the camp. Panorama of the beach, far away is white bear. The members of the expedition noise and shots distilled polar bears from the camp. Bear with cubs goes past the camp. A fragment of a page from the diary of Fridtjof Nansen, Nansen. The members of the expedition on the ground trying to identify the wintering site of Nansen in his drawings. Photography and the modern form of the wintering grounds of Nansen, discovered by the expedition. A detailed survey of the wintering grounds, fragments of walrus and bear bones in the hands of the members of the expedition. One of the members of the expedition working with a metal detector. The expedition members find a hunting cartridge Nansen, pass it to each other. The installation of the memorial sign at the wintering site of Nansen and Johansen. The members of the expedition photographed have installed their sign. Interior view of the memorial Cabinet of Nansen on the outskirts of Oslo, the things on the Desk Nansen, the book "Russia and peace" in Russian. Memorial on the wintering site of Nansen to the Land of Franz Joseph.